Storm Team 4's Dave Price has your forecast for Wednesday, April 25. The glorious stretch of weather that has rescued tri-state residents from a seemingly endless winter featuring "foureasters" and April snow has hit a speedbump. Showers associated with another storm system moved in late Tuesday and intensified overnight, with the heaviest rains lashing the region during Wednesday's morning rush, Storm Team says. Dark storm clouds loomed over midtown Manhattan as thunder rumbled in the distance, and city buses and some rails experienced weather-related delays. Later, local airports experienced some disruptions as well. Lingering showers and isolated thunderstorms are expected to keep conditions soggy and unsettled through the day Wednesday, with high temps not likely to break out of the 50s. Track the storm and get weather alerts right here. Storm Team 4 says three-quarters of an inch to an inch and a half of rain should be expected for a wide swath of the region, with locally higher amounts possible. No significant flooding is expected with the storm, a relief for those who dealt with subway station waterfalls and submerged roads as flash floods struck the tri-state last week. 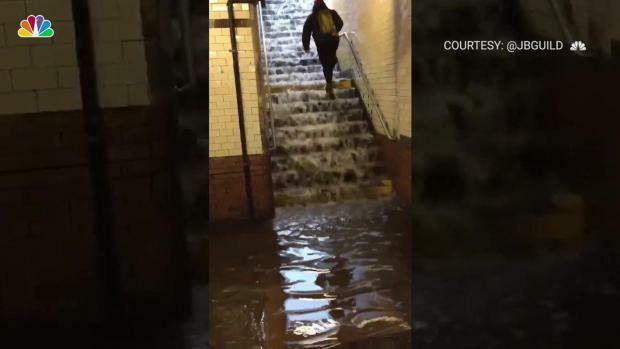 Crazy video taken at the 145th Street/Broadway subway station shows a man battling upstream to get out of the underground as water gushes down the station stairs. MTA staff told NBC 4 the City sewer drain was blocked, backing up to the point water flowed around the corner, on to the sidewalk and into the uptown station entrance. The video was taken after torrential rains hammered New York City Monday morning. Full story and forecast details here. Conditions improve slightly Thursday, with highs bumping back up into the mid 60s as storm clouds move away. Possible afternoon showers return to the forecast Friday, but the latter half of the weekend looks promising.